Meet Miller! Miller is approximately 2 years old (as of 5/15-17) and is simply stunning. He is the tallest yellow lab we have ever seen! Miller is great with older kids, as smaller children tend to be overwhelmed by his size and affectionate personality. Miller can be selective with other dogs, so he needs to be introduced properly. He has done best with medium sized dogs and not as well with smaller or larger dogs. He is crate trained and does well in the house as well, though he is always supervised in his foster home. So, his new family would want to either start with a crate or leave him alone for short bouts of time to ensure he is fully house trained. Miller knows sit and come and he is working on other commands in his foster home. He is even more gorgeous in person, so he would love to meet you and show off his beauty! You might be wondering how such a handsome, awesome boy, like Miller would be needing a furever home...well, we are asking the same question! 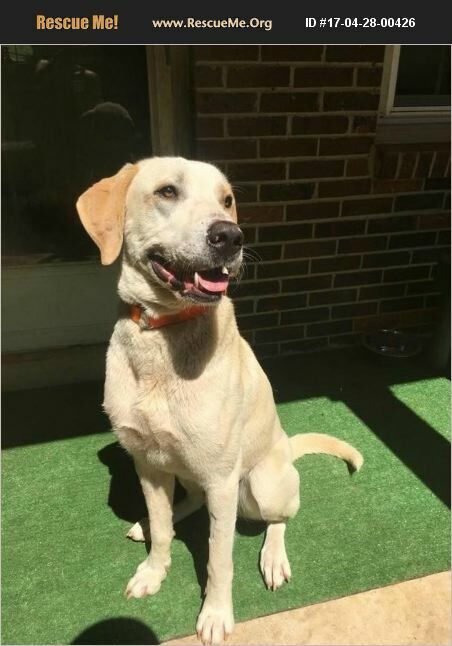 One thing is for sure, he won't be here long, so please get your application in right away via our website: RuralAnimalRescueEffort.org Miller's adoption fee is $185.00. I am neutered, UTD on vaccines, and microchipped. *An application and home visit are required **All of our pets are or will be spayed/neutered, up to date on all vaccines and micro-chipped prior to adoption. Please complete the application on our website and we will call you to answer any questions you may have. ** Our adoption fees not only help the animal being adopted, but they also help to cover heart-worm treatments and other treatable ailments that many animals, that would otherwise be euthanized, need to be made available for adoption. Thank you for choosing to adopt, foster, or aid in the rescue efforts of RARE! *****AN APPLICATION AND HOME VISIT ARE REQUIRED***** Please visit www.RuralAnimalRescueEffort.org for foster and adoption applications or for additional information. ***Please Note*** The breeds noted are guesses on the part of the volunteers of RARE based on the physical characteristics of the particular animal. We are not breed experts; therefore, the noted breeds may not be correct.